I read somewhere (I think their Twitter page) that they will be wearing them. Yup! Twitter page said more than once! Just wear those and the orange alternates all year at home. I'd be okay never see the home browns again. Would be awesome if they swapped the outdated serif wordmark for the new script being used in the endzones and a few other places. 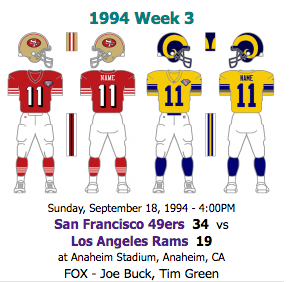 If the Rams make the playoffs, would they were the throwbacks or mono-white combo for home games? What if they play the Cowboys in Dallas? Would the Rams go throwback to match Dallas doing WAH, or would the Cowboys finally wear blue for a playoff game in their home stadium--forcing LA to wear white over navy? 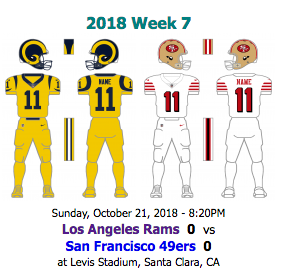 They would most likely wear the throwbacks in every one of those scenarios, the rams are never going to wear the navy jerseys again it seems. Does the NFL allow a yellow versus white matchup? I know the Patriots versus Broncos game in 2009 had white vs yellow, but that was acceptable. Do you really think the Cowboys will win the NFC East? I was just envisioning a hypothetical situation, nothing about the Cowboys winning their division (as a long-suffering fan, I even think it will be a miracle if they ever reach the NFC championship under the Joneses). The panthers have released their uniform schedule. They’re wearing black at Detroit week 11 so that sadly means the lions are wearing their god awful color rush that game. According to the Panthers schedule, they will be wearing black in Cleveland. Looks like a lot of games in all white for the browns this year. Minus the color rush. Does anyone else want to see the browns wear the orange alternates once this year? The panthers have released they’re uniform schedule. They’re wearing black at Detroit week 11 so that sadly means the lions are wearing they’re god awful color rush that game. No more blue socks now? Shut the :censored: up, Donny. The Panthers shouldn’t wear white pants at all. What a joke of a schedule for the Panthers in terms of uniforms. Wearing the blues only once?? And wearing white at home against 3 opponents that rarely come to to town? Pretty weak. It seems that they always host their divisional foes late in the year and wear the black jersey against them and we see those matchups over and over but then we miss out on matchups like the Giants, Cowboys, and Bengals. How many times have we seen the giants in blue against the panthers regardless of where the game is being played? And the bengals game back in 2010 was also Week 3. How bout put ATL and TB in Carolina early in the season for a change. And as for Cleveland, I’d much rather see them in their actual color (brown) at home even though everyone hates those for whatever reason. They wore it for 3 games last season and it was their closest 3 games all season. I thought that would’ve been a cool matchup in week 14 with the light blue accents of the panthers paired with the brown and orange jerseys but nope..
That's going to be a hideous and boring-looking game. Silver/black/gray (Panthers) vs. Silver/gray/gray (Lions).